Denon and Marantz flagship AV models get HDCP 2.2 upgrade, DTS:X to follow | What Hi-Fi? Flagship models from Marantz and Denon get upgrade to support playback of copy-protected 4K Ultra HD material. Owners of the Denon AVR-X7200W network home cinema receiver and Marantz AV8802 AV preamplifier can now receive an upgrade to provide support for the HDCP (High-bandwidth Digital Copy Protection) 2.2 protocol, enabling pass-through and playback of protected 4K video. The upgrade, which requires a hardware modification at an approved Denon or Marantz service centre, will be available from May 2015. The cost of the modification is the same for both models - €199 (£144). So why didn't the Denon and Marantz units have HDCP 2.2 capability when they were launched in December 2014/January 2015? The company explains that "we did not want to compromise on the limited bandwidth and colour cability of HDCP 2.2 implementations available at that time. Therefore, we did not equip the HDMI boards of the AVR-X7200W and AV8802 with it from the start." 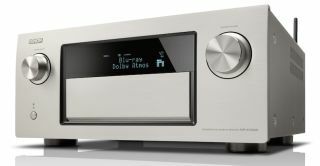 Now the issue has been resolved, Denon will start replacing the AVR-X7200W with the AVR-X7200WA model (€2999/£2166) which is factory fitted with HDCP 2.2 as standard. Similarly, Marantz will begin replacing its AV8802 model with the factory-upgraded AV8802A unit (€3999/£2889). What's more, both Denon and Marantz have confirmed they will update their flagship models later this year to handle the new DTS:X immersive surround sound format announced last week. They already handle the Dolby Atmos and Auro-3D sound formats. MORE: Dolby Atmos - What is it? And how can you get it?